Silk-effect white lacquer – silk-effect clay lacquer Silk-effect white lacquered base, wall and tall unit doors; metal, bronze finish insert. Silk-effect clay lacquered island unit door; metal, bronze finish insert. Etched, tempered glass tall and wall unit doors. Bronze finish Etoile handle. Satin Kashmir White, 4-cm thick, granite top with Etoile shaped edge. Etoile chimney hood. Etoile’s strong, elegant personality is set off by the metal insert applied to the corners of the wide frame that slants inwards where it meets the door panel. The modernity of the silk-effect lacquer, available in various soft and natural shades combines with the Italian tradition expressed by this type of door. Style and functionality: the tall larder units with their pullout doors optimize space exploitation by organizing it perfectly. Other refined details consist in the sinuous Etoile handle that matches the bronze finish of the metal inserts, while their curves are skilfully etched into the corners of the glass doors. The satin Kashmir White granite top has an impressive 4-cm thickness and an elegant shaped edge that gives it a lightweight appearance. The food preparation unit is provided with practical open shelves where kitchen utensils can be stored in line with Italian tradition. 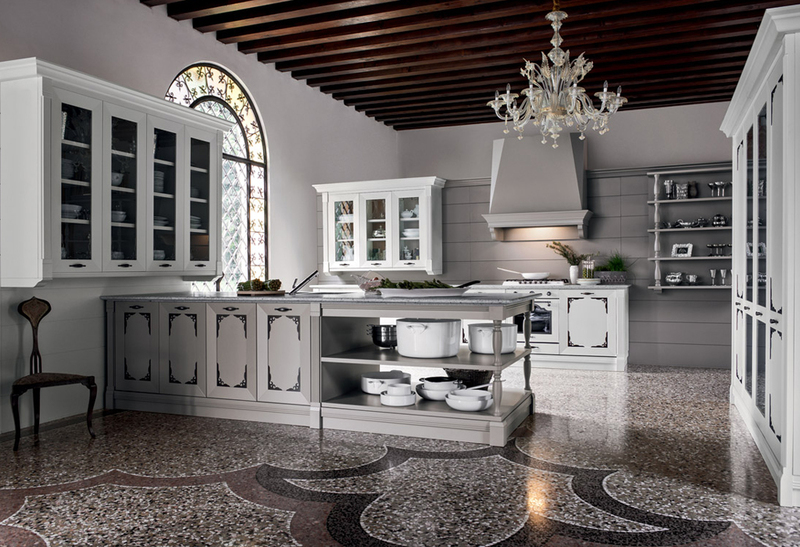 Etoile’s poetic bent expresses itself in many details such as the turned columns that support the open shelves of the wall-hung shelving unit; the original buttresses that support the hood and the wall units; the decorative cornices that finish the edge of the hood and the top of the tall units.